New Mexico Society Color Guard prepares to parade the Colors on Flag Day in Santa Fe, NM. Jim Thornton, Jimmie Fennell, Charles Martinez, Lionel Rael, and George Garcia are dressed in the Spanish Presidio Soldiers Uniform of 1780. The New Mexico Society over the past several years has researched the Spanish Presidio Soldiers garrisoned at Santa Fe and also the garrisons at San Antonio and El Paso, TX, Tucson, AZ and Presidios along the California Camino Real. Most of these Presidio’s took part in King Carlos III request for donations to his war chest to support Spain and France’s war with England in the mid and late 1700’s, the same time as our Revolutionary War. As Spain’s part in the war, King Carlos saw to it that shiploads of suppliers reached General Washington and the Continental Army (in most cases by the French Navy). It is recorded that tents, cots, blankets, uniforms, muskets, cannon, ball and powder, medical supplies all were part of the shipments resulting from the Spanish King’s war chest. The records of the Presidio Soldiers that provided financial support to the King are rather complete and the documentation is available thanks to the work of researcher’s like Dr Hough and others. These listings provide ample proof of eligibility for the descendents of these men to be members of the SAR. This has led to several members of the New Mexico Society tracing their heritage back to one of the Presidio Soldiers. 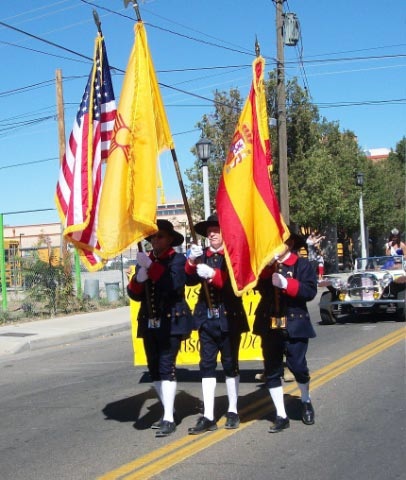 So it is an honor to have developed a Color Guard that represents the Spanish contribution to our Revolutionary war. The Presidio’s soldiers were not well supplied with uniforms until about 1775 and there after. A review of the Presidio’s, requested by the King and General Galvez, determined that a uniformed garrison was lacking and the quartermaster in Mexico City was directed that each soldier would have at least two uniforms – one for daily activities and the other for dress. 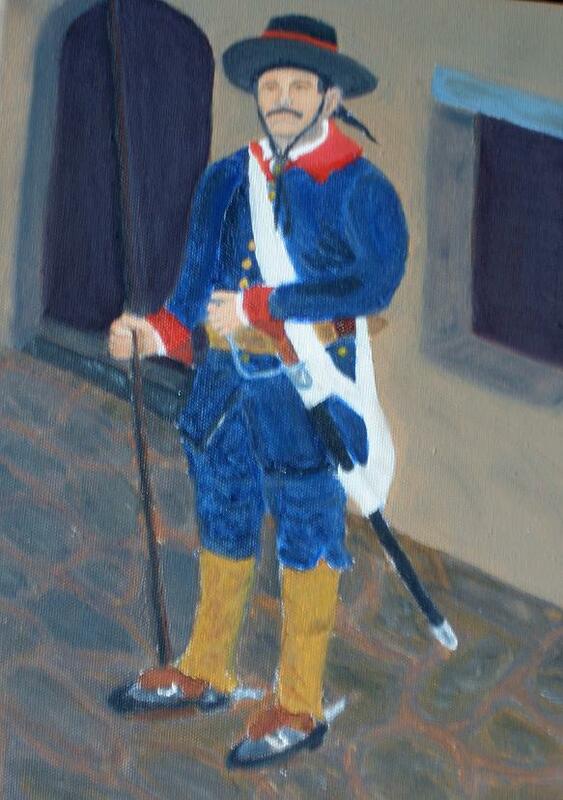 The basic work-coat and breeches of the 1780 uniform was selected for our Color Guard. Together with the gaucho hat, cotton shirt, white stockings and garters and white gloves, the uniform is a good representation of the 1780 Presidio Soldier. Much of the effort to define this uniform and to provide information as to who might make them goes to Rick Collins, a re-in-actor at the Tucson Presidio. Rick and his unit dress in the same basic uniform. Kim Breen, a seamstress in Tucson, provided the work coat and breeches to each Guardsman’s measurements. There are at least 16-brass button on the work coat and the breeches. The work coat is fully lined with the coat trimmed in the red collar and cuffs. More information on the uniform can be obtained from the author or George Garcia, Color Guard Commander. Future additions are being considered, such as a white leather shoulder strap and belt with the Chapter names on the shoulder strap. Gene Tomlinson discusses the Uniform in an educational presentation to the Santa Fe County Genealogical Society. 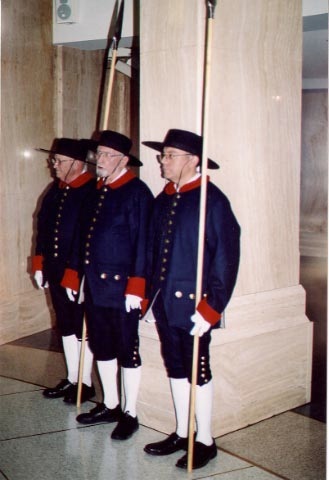 Our Color Guard has four Spanish descendents as members (three shown in the first photo) and five Anglo members at this time. It should be noted that New Mexico has about a 50-50 mix in population of Hispanic and Anglo citizens with nearly half a million first nation people on and off the many pueblos and reservations. And so it is an honor to represent the Spanish contribution to our Revolution by wearing the uniform of those who gave their funds to support our fight for independence. We have had good response to our uniforms as we parade, present and post the Colors and stand guard at various assemblies, both civic and cultural. We find that many of the Spanish descendents do not know about their ancestor’s involvement in our Revolution and particularly the school children are not taught about their ancestor’s involvement. To realize that their ancestors actually supported the birth of the Country they call theirs, gives them great pride. Many more of the Spanish descendents will join our Society as they learn that their ancestor had a part to play in our Revolution. Gene Tomlinson Jimmie Fennell, George Garcia and Jim Thornton prepare to present and post the Colors at the Bandstand on the Plaza in Santa Fe to open the annual Pancakes on the Plaza celebration for the 4th of July. More than 12,000 had breakfast on the Plaza as part of our celebration of the 4th of July and support important community projects in Santa Fe. 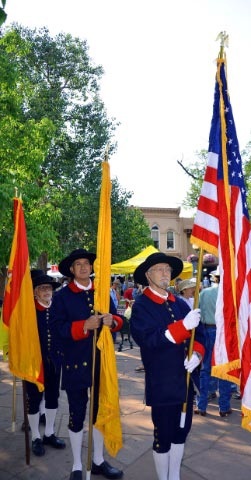 The New Mexico Color Guard has been active in Flag Day and the 4th of July celebrations in Santa Fe and the Palace of the Governors in Santa Fe and with the Hispanic Cultural Center in Albuquerque. We have also been a part of ceremonies at the State Capitol in Santa Fe for various civic and state occasions. As we grow and develop our Color Guard, now going on its third year of activity, we will expand across the state with units in the Las Cruces area (Gadsden Chapter) and in the northern area around Farmington, New Mexico (the Three Rivers Chapter). 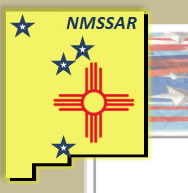 The New Mexico Color Guard will join with the Color Guard at the 2012 Congress in Phoenix, AZ in July to celebrate the Centennial for both States as the 47th and 48th State of the Union. Both Societies welcome all compatriots and their families to the Biltmore Hotel and Resort for the SAR Congress. For further information and details regarding our Color Guard and the Spanish Presidio Soldiers Uniform and the research that preceded the selection of our uniform please see our NM Society website nmssar.org and look to this Color Guard section and also the quarterly newsletters of the past several years that highlight our development and activities. On January 6, 2012 our Color Guard presented the Colors for the opening ceremonies of the State of New Mexico’s 100th Birthday Celebration at the State Capitol in Santa Fe. 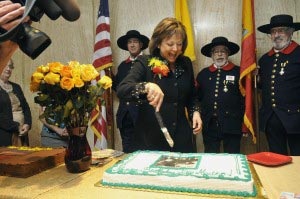 Governor Martinez cuts the cake honoring the State and its citizens and initiating the year long Centennial Celebration. Color Guard members Jimmie Fennell, George Garcia and Lionel Rael present the Colors and provide a fitting background for the celebration. 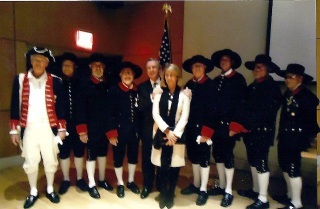 On Sunday, November 13th the Color Guard was present at the Plaque Presentation at the State of New Mexico History Museum in Santa Fe honoring the Presidio Soldiers of Santa Fe that supported our Revolution with their contribution to King Carlo III’s war chest. As a result of their support, the Spanish contributed firearms, cannon, uniforms, medical supplies, foodstuffs, tents, cots and bedding for Washington’s Continental Army. The documentation of their contribution allows prospective SAR and DAR members who descend from them to join our Societies. The project, proposed and supported by NM Society President Teddy Adams resulted in research by the Museum staff. The New Mexico Society supported in the search of records assisted by genealogist Henrietta Christmas. A poster listing all the names was produced by graphic artist Natalie Baca listing the names so descendents could trace their ancestor(s) who served at the Presidio. Museum Director Francis Levine co-ordinate the presentation and reception at the Museum that included Spain’s Ambassador to the United States, Jorge Dezcallar and former Palace of the Governors Director, historian and author, Dr Tom Chavez, both of whom spoke about the support that Spain provided to Washington’s army. The Plaque will be installed near the Palace of the Governors front door and Presidio Soldiers records will be available in the Museum files. The NM Society Color Guard presented and posted the Colors during the Presentation. Four of the members present are direct descendent of Presidio Soldiers. They are Vernon Casias, George Garcia, Charles Martinez y Vigil, and Lionel Rael. 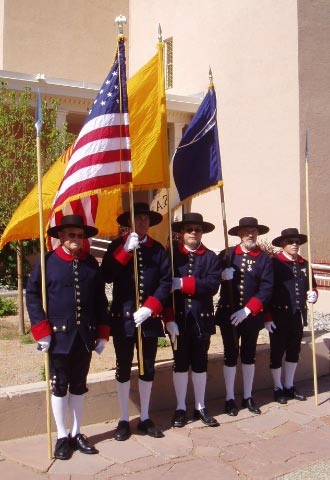 The Uniform of the Color Guard is based on the original uniform of the Presidio Soldiers of the period and was chosen by the New Mexico Society to honor them for their support to the American Revolution. The audience of over 75 attendees included many NM Society compatriots and members of Los Compadries group that support the Museum and other activities in Santa Fe related to the Spanish history and involvement in the development of New Spain and later New Mexico. 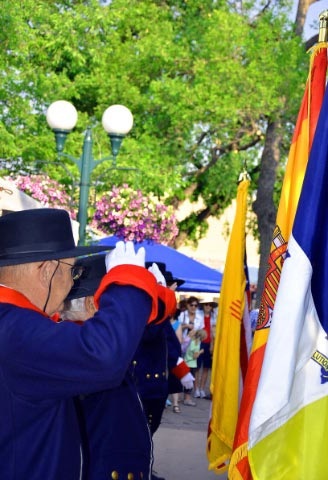 The New Mexico Society Color Guard of nine members have presented and posted the Colors at many civic and national events in Santa Fe and Albuquerque. The Gadsden Color Guard provides similar support in the Las Cruces area. Download the report submitted to the NSSAR regarding acceptance of Presideo uniforms.